Our budget econo roll up or pull up banner offer the ideal low-cost solution for those needing a simple means of displaying company information and offerings in a range of situations. 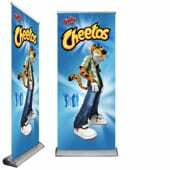 These premium pull up banner stands have an extremely durable roller mechanism and high grade of aluminium used in the base unit. These are lightweight and fold into a carry bag, making them easy to transport. These are excellent value for money and can be used year on year. Long time industry favourite. X-banners are a cheap and effective tension banner display stands. 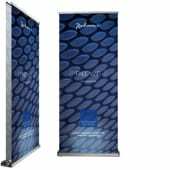 Unlike roll up banners or pull up banners these displays are supplied with a panel separate from the stand and work by holding the panel in place under tension. 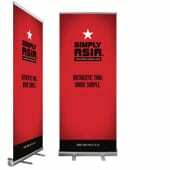 X-banners are not retractable stands, however they are very light weight and easy to use. One of the main benefits of using X-banners instead of roller banners is that the panel is easy to swap and replace. This means that panels can be interchanged onto the same stand without incurring the cost of buying multiple stand mechanisms. 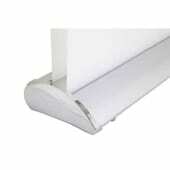 All our the banner stands in this collection have the option of ordering replacement panels only. PULL UP BANNERS, ROLL UP BANNERS AND X-BANNERS BY DISPLAY MANIA. WE OFFER NATIONWIDE DELIVERY FROM OUR CAPE TOWN & JOHANNESBURG BRANCHES. BEING A SADC ACCREDITED COMPANY WE ARE UNIQUELY QUALIFIED TO SERVICE COMPANIES THROUGHOUT THE SADC REGION. Display Mania are market leaders in the production of portable display stands such as pull up banners and x-banners that can be used for exhibitions, promotions, conferences and events. With more than 20 years of experience in producing portable marketing solutions and custom display units, our experienced staff compliment can help to identify the best solution to your portable marketing requirements. Our in-house graphic production facility allows us to meet tight deadlines, and enables high levels of quality control. Pull up banners and x-banners are great portable display stands that are designed for quick and easy set up. These display units offer the perfect solution for high impact portable branding at exhibitions and events. At Display Mania you will find one of the widest range of indoor portable marketing equipment available in Africa. To further compliment our wide range, we also offer pull up banners and roll up banners based on a wide budget range.We have the x-bannner and econo pull up banner, for more price sensitive, low usage market and our executive, delux pull up banner for intensive use and longevity. If you are supplying print ready artwork then we will not provide a proof as standard. We will match the artwork you have sent us. If you require a proof please contact us before placing your order. If you have selected the banner design service then we will provide a proof before going to print. We will however provide a layout for sign off on each and every job. We offer a low cost, fixed price graphic design service. Our team of designers can create a bespoke, high quality design to your requirements. More details can be found on our Artwork specifications page.